A useful accessory to use in conjuction with the The Pastiche Method® of Skin Analysis. The Pastiche PDM is a 16 function digital skin measuring device designed for professional skin diagnosis and skin physiology measurements. Used with your *Windows computer, it can become the primary consultation and analysis tool for the skin treatment professional. It is one of the new generation of professional diagnostic tools. Quantifies majority skin type and basic prevailing skin conditions. Data capture features allow you to store client images and measurements, with intelligent reporting on risk and contributing factors. Reports for client and clinician on demand. *computer system shown not included with device purchase. Suitable for Windows 7-10 devices only. There is no doubt that the secret of accurate skin analysis is a combination of a thorough consultation procedure supported by measurements of specific parameters of the skin provided by modern electronic skin analysing aids. The PDM is a question and measurement driven analysis procedure that collects data about your client during the consultation process. View the video showing the consultation and analysis process. Using a combination of the data gathered, the PDM provides comprehensive reporting of findings for both client and clinical use, including measurement values, images, and notes specific to any anomalies discovered. A complete history of clients previous measurements and images can be recalled on demand for comparison or confirmation of treatment effectiveness. The Pastiche PDM uses the most respected and recognised measuring principles to obtain data for your diagnosis; including the cosmetic industry benchmark Corneometer®, Sebumeter®, Mexameter®, Visioscope®, Sebufix® and Corneofix® technologies from CK Electronic GmbH. Technology provided by CK Electronic is used in many skin care development laboratories world wide. Using software enhanced imaging techniques, the PDM can be used to capture detailed images of the skin surface, anomalies and scars. These images can be stored in the clients personal record, and reviewed at any time to monitor treatment progress or anomaly change. Measurements of pore density, wrinkle depth, pigmentation and vascularity concentrations are recorded and provided in the reporting functions. By utilizing the images from the Visioscope®, you are able to collect a database of skin condition images for use as credible before and after photography in addition to staff training or consultation with other skin care professionals. Watch a short user guide video on the imaging here. The software for the Pastiche PDM has been developed by Florence Barrett-Hill, one of the world’s foremost exponents of professional skin analysis, and the author of the renowned, progressive books “Advanced Skin Analysis” and “Cosmetic Chemistry”. Florence has been an advocate of skin diagnosis devices in professional practice for over 25 years, and brings this wealth of experience of both the practical use and interpretation of the results to the Pastiche PDM device. The Pastiche PDM has additional features other than skin diagnosis, including scalp and hair condition evaluation and sun protection recommendation. 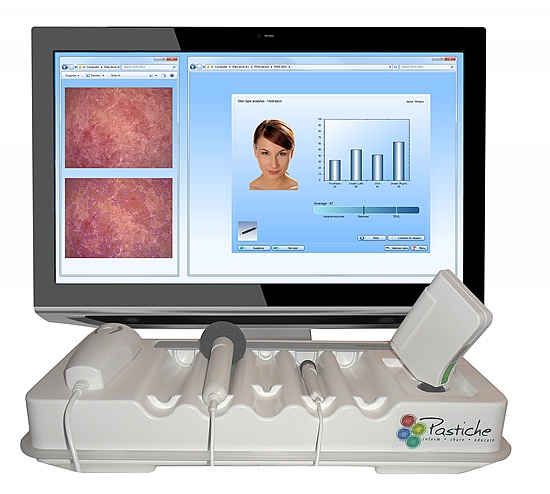 By utilizing the images from the Visioscope®, you are able to collect a database of skin condition images for use as credible before and after photography in addition to staff training or consultation with other skin care professionals. The Pastiche PDM device can become your primary consultation and analysis tool that will keep you competent and effective in today’s market. Contact us for more details. Download PDF brochure here. Technical specifications are here.